were taking up less of my time, my son gave me a set of pastels and sketching with these inspired me to begin art lessons in earnest. I enrolled at Brewery Arts in Cirencester and over the following 8 years I enjoyed classes and workshops both there and elsewhere, experimenting with various mediums and techniques, gradually developing an interest in portraiture. 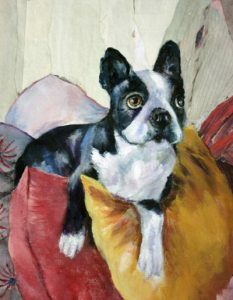 I now work in oils, acrylics and pastels and especially like experimenting with collage particularly when working on animal portraiture or to add interest or atmosphere in a painting. I particularly like capturing the life in an animal’s eyes. I exhibit with Tetbury and Cirencester Art Societies and more examples of my work can be seen on their website galleries.